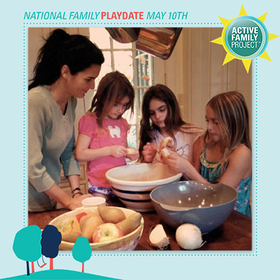 Active Family Project’s National Family Playdate is this Saturday May 10, and they’ve teamed up with celebrity moms, Angie Harmon, Lala Anthony, and Jennie Finch to help spread the word about the playdate and a great donation to KaBOOM! that will help create playplaces across the country. On average, moms say they have 5 family playdates a month, (i.e. time reserved on the calendar where the whole family participates in an activity together), but they’d really like twice as many according to a national survey from Merck Consumer Care’s Active Family Project. Busy schedules make it easy to postpone family time, that’s why the Active Family Project is hosting their 2nd Annual National Family Playdate. 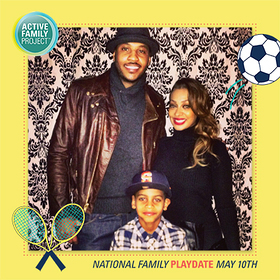 “As a family we love to go for walks in Central Park and of course Kiyan loves to play basketball like his dad,” said Lala Anthony. •	Schedule active family time on May 10! •	Visit www.activefamilyproject.com and www.facebook.com/activefamilyproject for inspiration and share one of their Playdate-themed posts to trigger a $1 donation to KaBOOM! •	Post your own plans and active family tips on www.facebook.com/activefamilyproject to encourage others to participate.